It’s dark and it’s your first time. Perhaps unsure what to make of the swanky staff dress code or walls adorned with art, rest assured—you’ve made it. The latest release from Organ Jazz Trio, New Standards For The Green Lady, bears the name of a venue that plays host to some of the best jazz Kansas City has to offer, and to OJT themselves two nights a week, the Green Lady Lounge. The forces comprising Organ Jazz Trio are Hammond organist and composer Ken Lovern, guitarist Brian Baggett, and drummer Kevin Frazee. The trio began somewhat of a residency at the Green Lady in 2013 and have since become a fixture there. Any of the three can be found around town in various groups: Lovern in 3 Trails West and Maria the Mexican, Baggett in DOJO and Brian Baggett Trio, and Frazee on drums in the Kevin Frazee Trio and Chris Hazelton Trio. Having played together for over 12 years, Organ Jazz Trio define cohesiveness. They play over a hundred gigs a year. Though no format can fully capture the essence of a live Organ Jazz Trio set, this release provides a glimpse into more than an hour of studio material produced by Lovern. The guys then undertake the Tears For Fears hit “Everybody Wants To Rule The World” where Baggett’s quaint solid state amplifier and Gibson hollow body guitar guide listeners to a memorable moment in the album. Clapton’s “Layla” is another essential listen. OJT’s renditions on New Standards For The Green Lady will force you to contemplate whether you prefer “I Kissed a Girl” or “Eleanor Rigby,” in their extrapolated jazz formats at least. Katy Perry is not typically an artist that crosses a jazz musician’s mind when a desire to go “outside the box” occurs but Organ Jazz Trio challenges the status quo with “I Kissed a Girl” and breathes swung, sophisticated life into the tune. Baggett and Lovern echo in unison on the hook of the track before one or the other eases into a tangent of improvisational virtuosity, as per usual. In no way is Frazee left behind in any of this as his crisp, dynamic efforts comprise the groove behind OJT’s essence. As it would be inconsiderate to leave without a personal touch, Organ Jazz Trio graciously included original work “OJT Theme 2015” as the finale of the album. Arguably the odd man out of the record, OJT originality in the track is unmistakable. The theme’s carefree sentiment is made possible by the loose and smooth slinkiness of the organ and Scofield-esque guitar work. 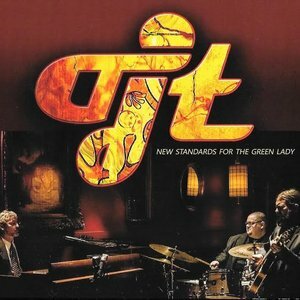 New Standards For The Green Lady is a strong follow up to the group’s 2005 debut recording Ken Lovern’s OJT and a good indication that few musical undertakings are too daunting for the trio to tackle.